I am looking for information about this stainless stell JLC. The number on the back is 1044857. Inside it is 21002. The movement is a K 886. 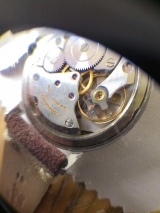 The dial look unusual because it is write “fabrique en Suisse” just below “Jaeger Lecoultre” (not at the botom of the dial as usual)… I have attached few pictures. Thanks in advance for any help you can provide. Thanks! FAB SUISSE on the dial is often what is found on watches sold in France. The "linen" dial" is quite nice . The size is 34mm without crown. Any idea of the model name and the year of manufacturing? It would be case reference 21002 what you have. I'd need the movement serial number for a date, but guessing 1968 or so. Movement dates to 1966. So watch sold 1966-1968 typically. Great! Thank you very much for the information.